When it comes to International SEO or, in other terms, when it comes to promoting foreign language content on multilingual search engines, ranking algorithms are calculated significantly differently from what you are used to in English. In fact, the multilingual content of a site bears different ranking algorithms according to each language… Think about it this way: Japanese is based on a 64-bit character alphabet, while English is a 32-bit alphabet. Of course, different alphabets and characters influence SEO-related technical issues, but foreign search engines are mainly faced with the challenge of having to differentiate between genuine text versus “faked” translations. Years ago, when content relevancy started to become a crucial aspect of ranking eligibility in the eyes of Google Technology, it also coincided with the era when automated translation tools such as Google Translate, Systran, Babblefish, etc., emerged on the marketplace as well. Numerous website promoters translated the entire content of their websites through automated translators, and published such material as an inherent part of their website in an effort to “legitimately fake” added content. In fact, even if we all know that such translations are mediocre, they still produce lots of “text content”… I have seen small websites of less than 100 pages translating automatically their platform in over 20 languages, thinking naively they could simulate a more significant online presence. This is why major multilingual search engines had to outsmart such misleading online marketing practice by refining their SEO requirements. For example, your multilingual versions will still be automatically indexed by the foreign language versions of Google… However, Google will then look at how your multilingual pages have been archived and prioritized in your Google XML Sitemap file (most automated translations are not configured properly within Google Sitemap files). Google Technology will then calculate your presence on other foreign search engines and directories that do require a manual submission process. Although meta tags arguably bear little or no ranking relevancy in English, they are still crucial with foreign languages. With many languages, the keyword allowance or even the character allowance and the way it has been configured within the source code tells foreign search engines right away the difference between a real website with live professionals behind the scenes, in comparison to a website which is just the emulsion of computer/software-generated material. In other words, if you are thinking of publishing a translated version of your site based on an automated translation, just don’t! It might even discredit your overall URL and, if poorly configured, could also affect your current rankings in English indirectly… Nothing can replace an experienced translator/native copywriter. 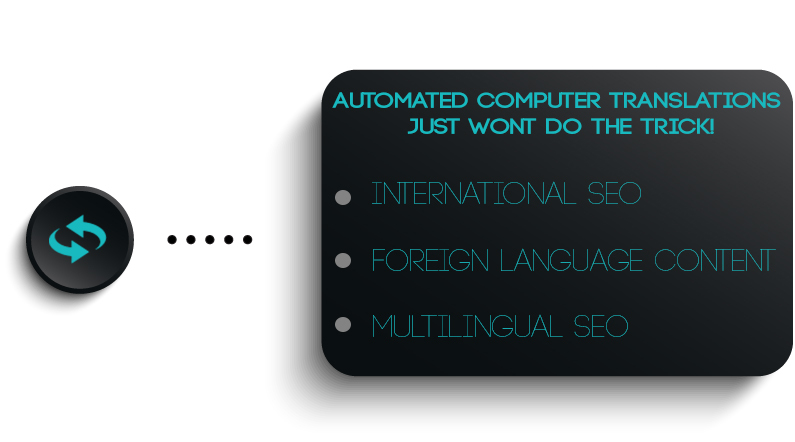 Automated translators are just there for convenience purpose and used only by a certain class of foreign individuals. Once again, publishing an automated translated content will not yield to ranking benefits. Get yourself a qualified translator and expert native SEO technicians. Go for the “real thing”! !